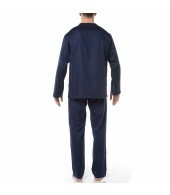 High quality cotton that has been tailored and designed by the finest Hom craftsmen. Exceptionally comfortable. Features include long sleeves, a round neckline with a button for fastening, elasticated waist and delicate geometrical design detailing. 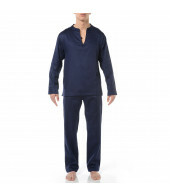 High quality cotton that has been tailored and designed by the finest Hom craftsmen. Exceptionally comfortable. Features include long sleeves, a round neckline with a button for fastening, elasticated waist and delicate geometrical design detailing. Material content: 100% Cotton. Wash with care.